April's New York International Bridal Week (known amongst us in the industry simply as Bridal Market) wrapped up recently, and we are excited to share with you all the newest fashions and trends straight from the runways and showrooms of the best bridal designers. While these gowns won't be available in stores until this fall and winter, we always have our eyes peeled for the latest and greatest looks to bring to our very stylish brides! We noticed the continuation of several trends from recent seasons - the use of color, peplums, and intricate necklines; looks that are still fresh with each designer's own signature style. But there are certainly some BIG new styles this season - Great Gatsby, anyone? - that are buzzing around the runways. The designers we carry at LWD are leading the pack (as usual - if we do say so ourselves!) and are right on point for the most up-to-date fashions. The "Deep-V" is a great way to add drama to an otherwise understated gown. Both Anne Barge and Jenny Packham showed new plunging neckline styles paired with soft and sophisticated draped gowns. We love how both designers added just a touch of sparkle to the shoulder or waist to accentuate the bold neckline. The bold back is still going strong in bridal fashion, which makes us happy - it's one of our favorite looks. The styles we are seeing from April Market are all about the intricacy. Rivini's sheer, metallic embroidery tastefully shows some skin and would leave an absolutely unforgettable impression while walking down the aisle. Claire Pettibone's gown frames the back like a piece of art in a halo of Swiss dots and delicate flowers. Gorgeous! Lace gowns have been oh-so-popular in the past few years, but you haven't seen lace quite like this. The classic strapless fit-and-flare style gets an update by Liancarlo with lace in a beautiful, Moroccan-esque Damask pattern. Unexpected takes on the classic material are a wonderful way to bring the wow factor to your gown while maintaining a timeless look. As predicted, the Great Gatsby trend is showing no signs of slowing this season. The neck-to-toe beading reminiscent of the 1920s calls for a shape that doesn't compete. Enter the Column gown. Jenny Packham and Rivini showed two different takes on this look, with a higher neckline and delicate belt by Jenny Packham and the all-out glamour of a thigh-high slit by Rivini. It's not just about how the gown looks, but also how the gown moves on your wedding day. After all, you won't just be standing still on your big day (at least we hope not!). Gowns with textured fabrics and 3-D details are guaranteed to move beautifully, and they create a look that is certainly not for the meek. Both Anne Barge and Liancarlo showed textured gowns with materials that we just want to reach out and touch! Barely-there straps and sleeves graced many runways and showrooms at April Market. Perfect for a spring wedding, it's also style that works well for brides who want something between strapless and covered up. Claire Pettibone presented a full-sleeved yet unstuffy style. (And who needs bracelets when you have those cuffs?) 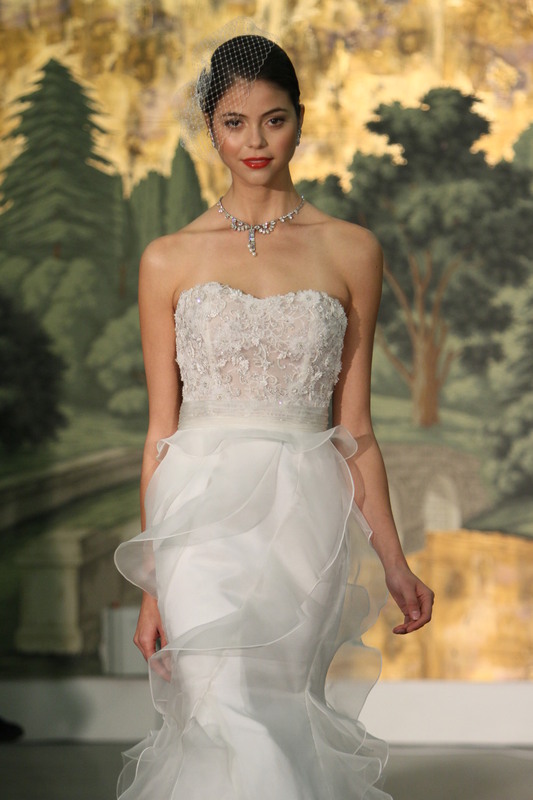 Jenny Packham showed a version that combines a flattering sweetheart neckline with the delicate V-neck of the straps.